Being a caregiver is not easy. It can impact their careers, their families and their health as well. Mary Ann has been a caregiver and knows that a long-term care plan reduces the stress on loved ones. As Americans get older, more family’s members are becoming caregivers. This caregiving places huge amounts of stress and pressure on people. Often, these family caregivers have their own careers, families and personal issues to be concerned about in addition to the job of caregiver for Mom or Dad. This caregiving is coming at a huge price, physically, emotionally and financially. The results of a recent poll show that while many caregivers attend to the needs of the person they are caring for, they often ignore their own personal health concerns. 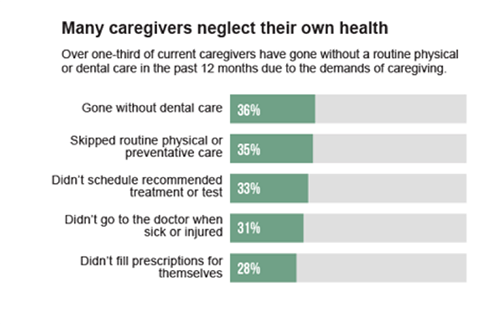 The survey, conducted by the Associated Press-NORC Center for Public Affairs Research, found about a third of caregivers have gone without normal health or dental care that most of us would not ignore. This includes skipping health check-ups, dental visits, delaying treatments for health conditions and even forgetting to fill their own prescriptions or seeing a doctor for their own illnesses due to their caregiving responsibilities. Despite the fact, these caregivers usually accompany the person they are caring for to their doctor’s appointments, the doctor and the caregiver will generally not discuss issues which are impacting the caregiver. The caregiver is not discussing these health and emotional issues with their own doctor either, so doctors could help by bringing up these concerns with the caregiver. One obstacle is a concern for medical privacy and the difficulty of billing the person for this advice. 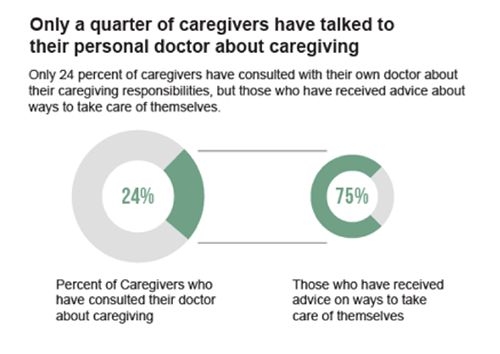 The poll indicates only a quarter of caregivers actually do end up talking to their own doctor about their caregiving and its impact on their own health. Forty percent of Americans have provided long-term care services and supports to either a family member or friend. As the population ages, more people will require help with normal activities of daily living or even supervision due to cognitive decline. If a person does not have Long-Term Care Insurance in place, this care will either be provided by friends or family members or through paid services which often will deplete assets. Health insurance, including Medicare and Medicare supplements, will pay for only a limited amount of skilled care services, usually in a facility. However, most long-term care is either custodial in nature (help with activities of daily living) or is supervisory in nature (helping a person who is suffering from dementia including Alzheimer’s). When no advance plan exists it often places the responsibility on the shoulders of a daughter or daughter-in-law or other friend or family member. These caregivers do have their own health issues to deal with. The poll shows nearly 40% have a health problem, physical disability or mental health condition that impacts their daily life or limits their activities. More than 25% say it's hard to manage their own health along with their caregiving responsibilities. “Caregiving is hard on the caregiver and the caregiver’s own family as well. This is why many people start purchasing Long-Term Care Insurance as part of their retirement plan because they experienced the impact first-hand with Mom or Dad. They tell me their stories of being a caregiver and its impact on their family. Not only is caregiving a hard job, but it is also difficult emotionally and even financially for the caregiver themselves,” said Matt McCann, a leading expert on long-term care planning and Long-Term Care Insurance. 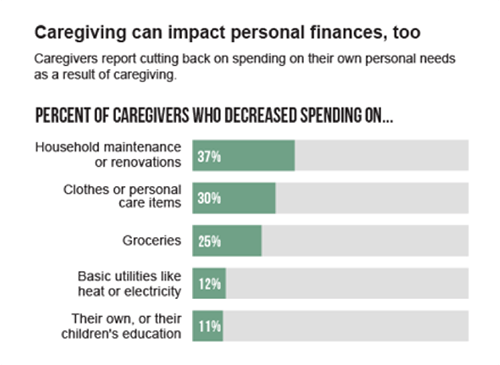 The poll shows the financial impact caregiving has on the caregiver and their family. Many must limit their spending due to having to take off work due to their caregiving responsibilities. “People are living longer but our extra years are often not quality years. Families are stressed with balancing caregiving with their other responsibilities. Paid care is expensive. Long-Term Care Insurance has become a key part of retirement planning. My clients don’t want to place this responsibility on their children; nor do they want the impact of that caregiving negatively impact their children’s health,” McCann said. Those families with Long-Term Care Insurance have a different experience than those who don’t. “Over the many years processing claims for my clients, I often speak with the adult children. Countless times they have shared with me how much they appreciated their parent’s decision to plan for long-term care. This took much of the responsibility and burden off the family, so they had time to be family,” said Brent Donarski, a Long-Term Care Insurance specialist who has been in the industry for 30 years. This poll revealed some ways caregivers cope. This includes praying, meditating, spending time outdoors or talking about their situation. However, 44% report lack of sleep, and 17% increase alcohol or tobacco use. “This is one of the major reasons people make Long-Term Care Insurance part of their retirement strategy. Protecting retirement accounts is always important. However, the peace-of-mind knowing the responsibility of their future care will not be placed on their children and their family provides them with peace-of-mind,” Donarski added. Traditional Long-Term Care Insurance – These policies provide tax-free benefits and case management which can provide assets and reduce the stress and burdens placed on family members. Generally, they provide a monthly or daily benefit and an initial pool of money to pay for the care. These benefits can grow with optional inflation protection. Only one major company offers unlimited benefits. Partnership Long-Term Care Insurance – These are traditional policies which, in 45 states, provide additional dollar-for-dollar asset protection in the event you were to exhaust all the money in the policy. This is a popular and affordable way to safeguard savings as you ease future burden on loved ones. Asset-Based or Hybrid Long-Term Care Insurance – These plans are either life insurance policies or annuities with riders which provide long-term care benefits. Only a few actually use the federal definition of Long-Term Care Insurance as most of these require you to be terminal in order to receive the long-term care benefit. However, several plans do combine life insurance or an annuity with long-term care insurance which provides both a death benefit in addition to Long-Term Care Insurance. There are a few major benefits to consider with these plans. They all offer a death benefit. Some offer an unlimited long-term care benefit. Some offer more lenient underwriting guidelines. This means they will consider coverage for people with some health issues that other plans would not. Limited Duration or Short-Term Care Insurance – These plans offer much more limited benefits (usually one or two years of coverage) than traditional plans. They have more lenient underwriting guidelines and over new coverage to older people, in some case through age 85. No matter the reason a person may require long-term care services and support. Care has a big impact on family members and savings. Experts suggest planning prior to retirement when premiums are very affordable. Plus, your health is usually better giving you more options to choose from. Many states offer partnership plans which can provide additional asset protection. Some states have tax incentives on top of the federal tax incentives which some people may qualify for. Find your state on the LTC NEWS MAP: https://www.ltcnews.com/resources/state-information. American families are benefiting today with tax-free resources from Long-Term Care Insurance. It pays for their choice of quality care in the setting they desire. All this without placing stress on their loved ones or being forced to drain personal assets. Getting older isn’t easy but the challenges of longevity can be addressed with advance planning.